Home / Political News / Did Parliament do anything that wasn’t Brexit-related this year? It would be easy to forget that MPs have more to do than trying to sort out Brexit. It has dominated politics, but has it stopped Parliamentary business-as-usual? What have MPs done in the last year? Since Parliament opened last June, the government has introduced 39 bills. Twenty-six of them became law in the 177 House of Commons sitting days before parliamentarians went on their summer break last week. Is this particularly slow progress? These numbers are not significantly lower than other recent years. Given that Theresa May’s party does not have a majority in the House of Commons, you might expect the passage of new laws to be sluggish. For example, there were 142 sitting days in the 2016/17 session, during which MPs passed 25 government bills. The difference this year has been the influx of Brexit-related legislation taking up MPs’ time. Has Brexit pushed other laws out? Five of this year’s 26 new laws were presented by the government as being crucial for Brexit preparation, compared with just one the previous year, with another two currently making their way through Parliament. According to our calculations, MPs have spent approximately 155 hours debating Brexit bills. The Institute for Government says 112 hours were spent on the EU (Withdrawal) Bill. 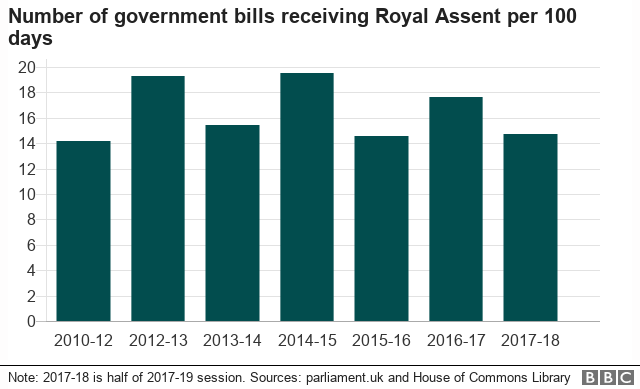 We are only halfway through an unusual two-year session of Parliament so the government still has time to pass more of the non-Brexit bills set out in the Queen’s Speech last year. But there are still at least three major Brexit bills to come – on agriculture, fisheries and migration – not to mention the approval and implementation of the final withdrawal agreement. What other laws have made it through? One of the more exciting things to come out of Parliament this year (it’s a low bar), the government celebrated this new law as the “most modern piece of space industry legislation anywhere in the world” as it received Royal Assent in March. The aim is to open the space industry to businesses by enabling them to launch satellites and experiments from the UK, where a large chunk of the hardware is already built and a lot of the expertise comes from. Government minister Jo Johnson wants to increase the UK’s share of the global space market from 6.5% to 10% in the next 12 years. The law – supported across the political spectrum – paved the way for the government’s announcement in July that Sutherland on the northern tip of Scotland would be the site of the UK’s first spaceport. During debates over the controversial Housing and Planning Act in 2016, campaigners and politicians pointed out that reduced security of tenancy agreements could affect those fleeing domestic abuse. They argued that the 2016 law decreased security of tenancies in social housing and that this could put victims of abuse in danger by making them less likely to flee the house of their abuser. The main effect of the Act is to ensure that victims fleeing their abusers retain a right to ‘lifetime’ secure tenancies when fixed-term tenancies become mandatory for English housing authorities. As the bill was introduced in December, Labour peer Baroness Lister – who campaigned for the change – said “women fleeing domestic violence will receive an unexpected Christmas gift”. Under current laws, people caught targeting pilots with laser pens could be fine up to £2,500. But this bill allows for sentences up to five years and unlimited fines. It also expands those protected by the law to include bus drivers, captains of boats and – most crucially – hovercraft pilots. A total of 1,258 laser attack incidents were reported in 2016, most commonly targeting pilots flying in to London’s Heathrow airport. There were no votes in either Houses of Parliament and the bill became law in May. The law came into effect two weeks ago. This two-page law, passed in February, aims to bring flexibility to life in the armed forces. It makes it easier for personnel to serve part time or restrict the amount of time they are separated from their normal base. The Ministry of Defence said this amendment to the 2006 Armed Forces Act is an attempt to widen appeal of working in the armed forces by making it more family-friendly and increasing retention of members.